Almost six months ago, I began this Android game development tutorial series hoping to teach the absolute beginner how to create a fully functional Android game. As of the previous lesson (Unit 4, Day 6), we have studied Java, created our first 2D Java-based Platformer, discussed the power of Android, and laid the framework for a 2D Android game. If you are new to this tutorial, feel free to look through the steps below. If you feel like you know enough about Java and Game Development to proceed, then by all means do so by clicking "Next" at the end of the page! 1. People who have been previously following this tutorial and have gained basic knowledge in Java and Game development. This tutorial was written for you. 2. People who want to bring an existing Java game to Android. 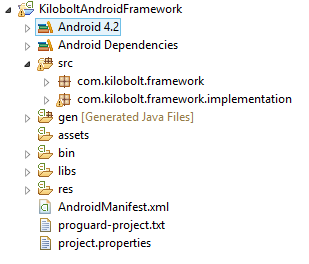 Following these steps will allow you to port most 2D Java games to Android. 3. Aspiring game developers testing the waters of Android Game Development. This guide will show you the necessary steps. 4. Anyone who is interested in Android or Games! If you are an absolute beginner, we recommend starting with Unit 1. The following is a detailed overview of Android Game Development. We elaborate on the game development framework developed in Day 5 and Day 6. In Days 5 and 6, we have developed the Android Game Framework that we will build our game on top of. If you do not have this framework handy (or are having issues with it), here is the full Project you can download and import into Eclipse. Change kilobolt to a name of your choice. II. You will also want to create a new package in the src folder. You can also change the name of the Project for organization. All of the classes that go into making your game will go into the 3rd package; however, you cannot directly port a Java game to Android. For example, Java's Swing class is not supported in Android, so you will not be able to use its methods (you would have to use methods that we implemented in package #2). This means you will be rewriting some of the code. In the newly created package, we can create our game. With a few changes, we can bring in most of the code from Units 2 and 3. If you are creating a game from scratch, you would just follow the following structure to create the fitting classes. How will this game be structured? Our game will have just one Activity (recall Activities are windows) that will display a SurfaceView (that we create using the AndroidFastRenderView class). This SurfaceView will paint objects (created using classes like Robot or Platform) as they update. 1. Create a SampleGame class in the 3rd package. Extend AndroidGame. Since AndroidGame implements the Game class from the framework you typically would have to implement all the methods from the Game class inside AndroidGame. However, since AndroidGame is an abstract class, you can choose not to implement certain methods. However, you would be required to implement these methods in any subclass that extends AndroidGame (in this case SampleGame). We would make SampleGame the main Activity of our game (we will do so in the AndroidManifest in step 4). That way, when we start the game, the SampleGame class will be instantiated, and the methods from the Activity Lifecycle will be called (starting with the onCreate). These methods are all implemented in the AndroidGame superclass that SampleGame extends. As it is, this would create a 1280x800 canvas for our game. This canvas will shrink or stretch to fit any device. All screen classes have three important classes. The update() method, and the paint() method, and the backButton() method (which is called when the user presses the back button in the game). In the update() method, you load all the resources that you will use in the game (i.e. all the resources that we have created in the Assets class). We would not need anything in our paint() method, unless you would like to have an image while the game loads these resources (make sure you load this in another class). The files used in this example: menu.jpg, explode.ogg must be placed in the assets folder of our project. Notice that here we also have the three methods: update, paint, and backButton. In addition, we have added an inBounds method that is used to create rectangles with coordinates (x, y, x2, y2). This is the screen on which we will run our game. Think of this as the StartingClass from Units 2 and 3. Using the same techniques that we have used in the MenuScreen above, along with the game development techniques from the previous lessons, you should now be able to create your game. Begin experimenting using the sample below. If you ever get stuck, return to Kilobolt.com as I will be continuing Unit 4 by porting our game from Units 2 and 3 to Android. You can see a fully working example here. In addition, I will be demonstrating how to create a High Scores screen, Splash screen, and demonstrating how to Restart the game once the player dies. Use this as a starting point for your game! // You would create game objects here. // We have four separate update methods in this example. // Depending on the state of the game, we call different update methods. // This example starts with a "Ready" screen. // When the user touches the screen, the game begins. // state now becomes GameState.Running. // Now the updateRunning() method will be called! //This is identical to the update() method from our Unit 2/3 game. // 3. Call individual update() methods here. // This is where all the game updates happen. // First draw the game elements. // Secondly, draw the UI above the game elements. // Call garbage collector to clean up memory. // Darken the entire screen so you can display the Paused screen. With the game finished, we must edit our AndroidManifest file. - We set our Main Activity (the class that will open when the application starts). - Set the version of the game. The versionCode just represents the release number (1st release, 2nd release). So each time that you patch the game and upload it to the Play Store, you would increase this by 1. The versionName is the game version that is visible to users on the Play Store. You can make this whatever you'd like. - You can change the icon here by placing an image into the drawable folder. Right now, it is the ic_launcher.png. - Change the label to change the name of the Game. 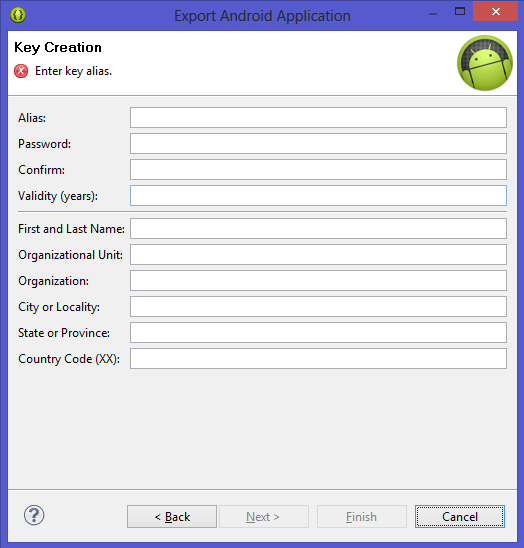 - Set the Main Activity by changing android:name as below. You can have a separate "label" for each activity in your app. We only have one activity, so I make it the same as that of our application. We must also set permissions that our game might require, as Android prevents applications from doing things that might harm the user's experience unless it has been granted permission. Those are all the changes you need! 1. Right click on your Android project. 3. Each time that you export the game, you must sign it (literally put your information on it). - If you have never published the current game before, you must create a new keystore file. Make sure you store this somewhere safe and make copies. You must use the same keystore each time that you publish the same application (so if yuo want to update your application, keep your keystore safe! Alias is the name of the keystore file. You can call this keystore1, myKeystore, etc. Password: can be anything you choose. At least 6 characters. You must remember this password! Validity: This is how long your signature will be valid. A good number is 30 years. You can choose to fill out the remaining information as required. - You can also load a keystore by browsing to the keystore file and entering the password you set. After you sign your application, export your APK to a location of your choice. You will now be uploading this to your Developer account. To publish the game, you must first register for an account. There's a one time registration fee of $25. After that, you can publish as many apps as you would like. After you have registered, the interface makes it extremely easy to upload your app. Locate your new application. It will begin uploading. 2. Upload assets, such as promotional graphics, icon graphics, etc. These images will be used throughout the Play Store. 3. Fill out the listing details, including the name of the application and the description. 3.Select Publishing options. Decide which countries you want to target, how much you want to charge, etc. 4. Finally, Consent by acknowledging Android Guidelines and legal compliance, and scroll up. 5. Hit the Publish button. Congratulations! You have published your first game. I have given you a quick overview of how to create an Android game from beginning to the end. Now the choice is yours. If you would like to follow along as I create a fully working example, move on to the next lesson. If you feel like you can handle it on your own, I wish you much success! 1. Following our libGDX tutorial series if you would like to take things to the next level (Uses OpenGL - Target iOS, Android, HTML, Mac, Windows). 2. Liking us on Facebook! 3. Linking to us on various forums and websites! Feel free to email me questions at jamescho7@kilobolt.com.